Local Leap groups have been coalescing in communities across Canada, and campuses are starting to join them. The University of Toronto (U of T) is the country’s largest post-secondary institution and home of Leap U of T. Founded in 2016, the group has grown to include more than a dozen core organizers that are working hard to create a campus-based Leap Manifesto and reignite the campus fossil fuel divestment campaign. They recently hosted a convening at U of T’s “Dis-Orientation Week,” and have been building ties with a range of other student groups, including the Native Students Association, Fifteen and Fairness, and the Student Labour Action Movement. Leap U of T is also participating in an emerging progressive coalition to resist their student union’s austerity policies. I spoke with two Leap U of T organizers, Julia DaSilva and Roxana Erazo, about their organizing work and what it might look like for a university to take the Leap. Find Leap U of T online at Facebook/LeapUofT, @TheLeap_UofT on Twitter; or email the organizers at LeapUofT@gmail.com. Justin Fisher: What made you bring The Leap to campus? Julia DaSilva: I co-founded this group with another friend, Jeremiah, and we were inspired by the message of The Leap. I experienced a very personal, immediate connection to the climate crisis, in a way I had never had living in Toronto, when I spent the summer with my relatives in Portugal. They were having record forest fires, which got way worse this year. 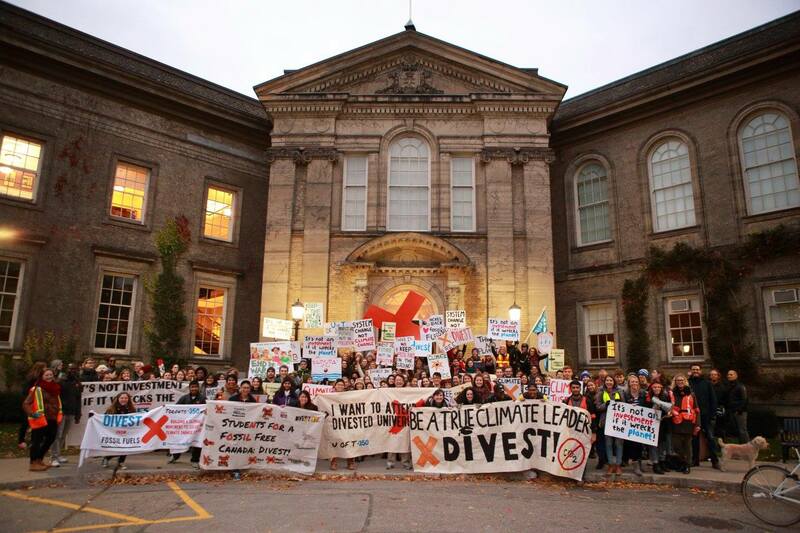 So when I got back to university, I knew we had to do something, but it didn’t seem like there was any group doing this exact type of work at U of T—especially since our divestment campaign ended in 2016. We thought The Leap was a message that we could really get behind and rally people around. Initially, we thought our role would be educating people, because we were really new to this and didn’t have a sense of how to organize. But as we began to do our research and found out about the divestment work that had happened, we thought maybe we could link these together and have an actual climate justice-based campaign at U of T.
Roxana Erazo: I joined for personal reasons too – I’m from Ecuador, and the Amazon is invaded all the time by fossil fuel companies. So I relate a lot to Julia’s reasons for joining the club. JF: What special opportunities do you find are provided by organizing at a university? RE: There are a lot of people here! There’s a huge range of diverse people, opinions, and interests, and as they become engaged with the issue for the first time, it brings different perspectives to the club that we wouldn’t get otherwise. And there are also a lot of resources here that we have since we’re a recognized group, from a meeting space to printing, and most of all, networks of people and groups. JDS: Yes, having a large number of groups concentrated in one place leads to a lot of connections – with the local Ontario Public Interest Research Group (OPIRG), say, or with those working on getting progressive slates elected onto the student unions. JF: What has Leap U of T been up to so far? JDS: We began having meetings last fall. We spent time figuring out what the role of a Leap group on campus might be, and we really launched our current campaign and vision through brainstorming and strategy sessions this summer and fall. So now we have a parallel approach: we’re developing a U of T Leap Manifesto, which is our vision and a base for collaborating, networking, and building solidarity with other clubs, and combining that with the relaunching of the fossil fuel divestment campaign. JF: The process you’ve launched towards a U of T manifesto began at a student event called Dis-Orientation. What is that, and how was your experience with it this year? JDS: Dis-Orientation is organized by the Toronto OPIRG chapter, and is an alternative orientation. The idea is that people get oriented in their first week of school, then realize everything that’s wrong with the world and get disoriented (laughs). It runs for a week, and each group gets a block of time and you can do what you want with it. We did a brief intro to climate justice frameworks for thinking about the crisis—then we spent most of the time in a collaborative, creative workshop where we broke people up into groups and talked about localizing Leap demands on campus. My worry going into it was that we would give the presentation, and people would get it, but then we’d split them into groups and they would not have a lot to say or the tools to have that discussion meaningfully. But it wasn’t like that. I had printed out a bunch of articles, and things from the Leap blog to give as examples, and no one ended up looking at them. We instantly got into this really productive, engaging conversation. RE: People had a lot to say about what they thought was wrong on campus and what solutions they wanted to see implemented, and how they wanted to see that happen. We spent a lot of time on food (laughs). JDS: In about an hour and a half, we ended up with 7 fully elaborated points. There are definitely some gaps in those points, but we are going to be developing those as we move along. It was definitely a surprise how much we got done in that amount of time. JF: That’s amazing to hear. I think off-campus Leap groups are also finding that once they call a meeting and bring people together, there’s no shortage of ideas for what sorts of things we should be working on together. A big part of Dis-Orientation is clearly connecting with other student groups. In what ways do you plan to work with other organizations on campus? RE: We’re going to continue to do outreach, focusing on adding demands to our manifesto, as well as endorsing other groups’ actions and events and promoting them on our platforms. JDS: A concrete example is that we’ve been doing work with the Fight for 15 and Fairness chapter. We’ll be tabling with them at the end of November, where we’ll each have our petitions, and where we can cross-promote and help people see the connections between the work we’re doing. We’re also holding another participatory event in November, focused around a particular theme, where we’ll continue to get participants to suggest demands. So it’s a process of building connections, seeing what other groups are doing and what their goals are—and eventually, when we have something that looks like a finished draft, convening people to clarify it and find out what it would take for groups to formally endorse it. JF: Can you give a couple examples of points from the manifesto? JDS: Well, as you might expect, one of them is divestment from fossil fuels! But our second one asserts that access to education is a fundamental right, which is a way of working towards free tuition. There’s full implementation of the Fifteen and Fairness demands. There’s the idea that a university should be a regenerative community member, not an isolated, extractive institution. One thing we’re calling for is a campus-wide urban agriculture program, but also where excess food from dining halls and campus food services can be brought to a central area and made accessible both to the broader community. So it’s about integrating the university into the community as well. We’re still working on public transportation—there are so many commuter students at U of T, so it’s a huge issue. RE: We can work on that with the commuting council here. They’re conducting a referendum on free transit for students who travel something like 25 kilometres to campus, so that presents another opportunity to work with another group. JDS: And we’ve been talking with the Native Students Association about an Indigenous rights clause; obviously, just like with the original manifesto, this one can’t be released until it clearly has decolonization as its base. JF: Can you touch on why the manifesto provides a useful framework for campus organizing? JDS: A lot of the time, it’s easy for the work you do on campus to become very insular—so even if you’re doing wonderful things like organizing around divestment or student unions, it’s sometimes easy to lose perspective. So what a process like this does is make concrete all the abstract ideas that link us to the broader world. It connects our everyday campaign work to a broader idea of the institution we want, and then that connects to the broader vision of the Leap Manifesto. JF: Indeed, listening to your demands makes me think about the role a university should play in a community, which is really inspiring. As you say, they tend to be insular, and academics can be very inward looking. But it sounds like many of the points you’re developing are really outward looking and connecting the university with its broader context. JF: Last year, the U of T decided not to divest from fossil fuels, despite a recommendation to do so from its own advisory panel in late 2015. Why are you bringing the campaign back now, and what makes the situation different from last year? RE: I think there’s been a huge change in the way that people talk about climate change. Now everything is seen through a climate justice framework, as opposed to an abstract science issue that people found hard to connect with. Now people see it as a social justice issue, which it is, and people are learning more about how fossil fuels directly impact communities that are already struggling. When the disaster happened in Puerto Rico, I feel there was a huge change in the way people responded that I’ve never seen before. The vocabulary was completely different. People talked about colonization, and a just recovery, not just about the schematics of hurricanes. People really want to fight, and I think we can capture that with the divestment movement. JDS: It’s also important that the administration knows it can’t get complacent. Whatever strategy winds up working, it’s important that they don’t feel they can submit a glossy report about responsible investing and then wash their hands. So in terms of the campaign, we’ll be looking at different strategies to put a new angle on it. One thing we’ve spent a lot of time working on is bringing in new members; the U of T is structured around a bunch of individual colleges, so we’re working on campaigns to get the colleges within the U of T to divest, with the narrative that we’re building an alliance to do what U of T administration wouldn’t do. JF: What advice do you have for students on other campuses who are interested in organizing around The Leap? RE: Organizing is really easy with social media now, so people should use it as much as they can to promote their events and connect with other groups. JDS: Doing this requires a lot of relationship building with other groups and people who are already doing the work. We can’t stay within the bounds of one issue—for example, we can’t just be the divestment group and not engage with others. So really from the start, it’s about emphasizing interconnectedness, and not being afraid to call a meeting and get people’s ideas! RE: You also need to represent who you are to those different groups, and I think a big part of The Leap is that interconnectedness. If you’re starting a Leap group, it’s not a single-issue campaign, it’s all these issues combined, and at the centre of it is climate justice. So it’s important to connect with all the social justice groups around campus. JF: Has anything surprised you that’s come up so far? Anything that you didn’t expect? JDS: The thing that surprises me is how much appetite there is for the kind of thing we’re doing. When you spend a whole summer in your group strategizing, then you come to campus and set up at the club fairs, we’ll say things like, “are you interested in climate justice?” And people will be like “oh, yeah!” And they’re excited that we’re there. Sometimes in organizing you feel like you’re imposing on people, or that people just want to move on with their day, but a lot of the time they’re really happy you’re there! RE: It’s easy to forget in your daily life that people care about the Leap demands, and it’s important for people to hear them vocalized. JF: Do you envision any ways of collaborating with other university Leap groups? JDS: This is all unexplored territory, but in my wilder fantasy moments, I imagine broader convening events where we have an Ontario or a Canadian Students for the Leap Manifesto. I think it would be wonderful to articulate a common set of principles that are specific to students. In the immediate future, we want to do things like publicize each other’s actions. It depends partly on what other campaigns come up and how we can link the narratives together. That’s a key thing that we can do for each other as Leap groups: build each other into the broader narrative of The Leap, which has the potential to connect every narrative! JF: Most importantly, how can interested folks get involved with Leap U of T? JDS: They can find us on social media: Facebook/LeapUofT, @TheLeap_UofT on Twitter; email us at LeapUofT@gmail.com; find us on take.theleap.org under the list of groups; and for U of T students, we are on the U-Life website as well, at utsu.ca. If you’re at U of T and just want to come by our meetings, we meet at Innis College every Monday at 5:00pm in room 313! RE: And our Divest U of T petition is on the Fossil Free Canada website: campaigns.fossilfree.org. Sign it! Julia DaSilva is in her second year at the University of Toronto, studying Philosophy, Literature & Critical Theory, and Indigenous Studies. She is a fantasy writer and poet who got involved in climate justice work through anti-Kinder Morgan mobilizations last year, and, as well as Leap U of T, has participated in electoral reform and Fifteen and Fairness organizing. Roxana Erazo is a full-time student at the University of Toronto, studying Environmental Biology and English, combining her passions of science, particularly climate science, and writing. Justin Fisher is a community organizer and activist hailing from Treaty 6 Territory in Saskatoon, SK.